I wrote a chapter in a book published by Relevant Books (The Relevant Church) where I suggested five realities awaiting us in our immediate future. 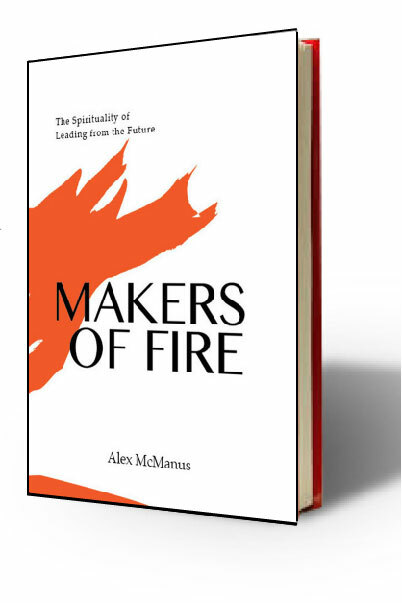 One of those five realities is that “the future is spiritual.” How do I know this? Simple. The future is here. As someone who has been labeled “post-modern” (still trying to figure out precisely what that one means), I’d have to say that this is entirely unsurprising to me. I prefer to believe in possibilities. I am comfortable with not have all the answers; in fact, I think that the process of seeking answers might at times be more important than the eventual answers concluded. If the rest of the world is, supposedly, with me in those attitudes then it makes sense that they would be more open to the possibility of a spiritual plane than a person based in hard logic and the scientific method, like my father. Besides, thinking that we know about everything in the universe seems so arrogant. Isn’t it easier to believe that there are things we don’t know about? So who is to say there isn’t a spiritual world, or ESP, or fairies or life on other planets or even whole other parallel worlds? Isn’t the idea of possibilities what keeps us seeking the Mystic? This seems obvious to me as well, but most of us who blog and live in the virtual world are in the future. There are some Americans yet to get their own email address. The future arrives faster for some than others. The way we do ministry needs to reflect the hyper-spiritual world in which we live. We may be aware of the openness to spirituality around us, but do our ministries, our churches, our own personal outreach efforts speak to a world which is aware of these things? Humans are by nature spiritual. If we begin with Genesis 1-2, it becomes possible to gain great insight into humanity. Humanity was created to be in relationship with God and to serve as God’s representative agents to creation. Genesis 3-11 narrates the alternative path that humanity has chosen, but each person remains in some part an approximation of the imago dei (God’s image). Missiologically, this indicates that there will always be a “spiritual” impulse in people. Will we be missional enough to walk through the doors that seem to be open? In a way the future looks like the past. All throughout biblical times the paranormal was…well…normal. So can we say.” back to the future?” I believe that there are many such paranormal things and that while they can be a point of conversation to reach common ground for today’s culture, we have to recognize the “powers” that are not from God and the powers that are from Him. Figuritively and literally, this discernment allows the exorcist (whether he be a spiritual exorcist or an excorcist of falsehood) to truely exorcise (spelling?) the real demons and not the spiritual things or truths that come from God. Acknowledging the paranormal is a large step to finding common ground with the common man. By the way, belief in the paranormal is not illogical. One of the most revered analytical (logic based) philosophers of our time, Alvin Plantinga would most likely agree with the above statement. But this discernment (what is from God and what is not from Him) is part of reaching the “not-yet-believers” who believe or are even involved in the paranormal. Of course the mesuring stick for what is and what is not is found in the God’s Word. Maybe all of my rant here is just to say that we should never forget to constantly use of our Word sword in this mission for the hearts and souls of men and women. Truth is gonna get muddy in this upcoming age if it has not already been stained. And maybe this muddiness is not all that bad because it will prevent people from being arrogant about knowing truth. But as Erwin has said before, we know things that we shouldn’t know. We know things that we’re not able to retain or obtain on our own (i.e. Peter acknowledging that Jesus was the Messiah and Son of God). One of the main tools for this knowledge is His word. Now that we are aware of this pattern we should all the more exhibit the “paranormal” that lives within us. Paranormal activity sounds like a great ‘inroads’. I am all on board with the future being spiritual. Because I am living in it. We are on huge learning curve right now with the supernatural and I have the priveledge of working with students in all of this. Recently (last night) we had a healing in our group along with some other things. The response from the students was an increase of faith however as the word spread today at their school I began hearing different reports as to what actually happened. I have also had to talk to a parent about what did and didn’t happen. All of this lead me to the question what do we do with this future that is spiritual? Leaving a comment so I can get the updates to this comment stream. A remakable thing about this trend is that even those within academia are starting to jump on board and acknowledge “the paranormal”…..
For so long there has been a stigma from the intelegencia regarding such topics. Now, it is interesting that several people at the top of the academic food chain are giving it lot of consideration. It appears that string theory, qauntum mechanics, and acupunture have confused the heck out of newtonian materialists. I think this foretells of a forthcoming redefinition of what it normal and what is paranormal (or superstitious). Paranormal is my normal. I am a Mystic by birth. Know the Passion of the Christ, Felt the Pain in the Sacrifice. Foresee the future, understand the Ancient Spiritual texts. Predicted Katrina and Rita to down to the date, devastation, and place. Tried to warn President Bush and the National News Media. Yet, they continue to ignore me, they know. I am a Light worker, using my energy to serve for the Betterment of Humanity. Sent back to try to save the World. There is always a light in the dark, glo for it! Sure. Why not? I mean, I believe in Heaven, and that there is a Hell, and I believe in Angels, and God, whom I can not see. So who am I to say there aren’t aliens, or other worlds, or ghosts? In fact, I think many times Christians believe in the good…the Guardian Angel…yet leave out the part of the demons your Angel is fighting off every day for you. Or the eerie feeling you get when going into a house or builgin that just doesn’t feel right…if you were looking hard enough would you find it to be haunted? I don’t like being scared, I avoid all scary movies…even jumpy movies, so I have not experienced these hauntings and gone after talking with the dead, but I know some people do. So I guess I do believe it all does or can exist…doesn’t mean I participate in it. Paranormal? Totally. And what a great opportunity to speak into a culture that is willing to talk about it. My students are shocked and intrigued when I confirm the existence of demons, exorcisms and the walking demon possessed as everyday occurences. We’re in a spiritual battle, and it is DANGEROUS for us to ignore or dismiss enemy movement! I think our challenge is how to take that spiritual hunger and direct them toward a fascination with the GOOD paranormal, like how I hear the voice of God, dreams, visions and prayer. Isn’t it fascinating that bad paranormal is embraced and good paranormal is dismissed? A fallen world this is! People often say to me that, since demons and the supernatural don’t manifest themselves, as they do so often in the Bible or even in ancient texts from Biblical times and prior, perhaps we are simply smarter people nowadays and understand more about the physical and even metaphysical environment. We, as they put it, can dismiss these rumors and encounters as simply physical phenomena, brain activity, or electrical stimulations and impulses. I think one of man’s greatest downfalls is his advance in scientific knowledge and the ensuing dependence on that knowledge for the explanation of EVERYTHING that happens around him. That, my friends, is one of Satan’s strongest allies. Genius hinges on Insanity, only when we are not true to ourselves. We have been taught many things based on Fear. Understand, that is the best way to control people. When paranormal is your life, you learn to keep most occurances to yourself. That we are “posessed” people. Our Ancient Spiritual Texts are but a written exhistance of man. It is understanding the messages that are spoken the same. That is to Love all as ourselves. The sad part is most of us do not love ourselves. We are filled with a dis-ease of within. We search outside to fill that hole within. Now, entering into a new Spiritual World, we will see more and more paranormal. Check out http://glolady-paranormal.blogger.com for some of my photos of UFOs. You can’t walk on water if you won’t get out the boat! Glolady, The links are not working. Can you help? Any brainstorming on what that means to any respondents would be appreciated. Will be adding more photos as time permits. Beth, thanks for asking for clarity. Generally our evangelism methods try to turn atheists into believers in Christ. We try to convince people who don’t believe in anything to believe in the spiritual. Now,we need to learn to share Christ to those who believe in more than we do and show them how that Christ isn’t just true but He is Truth. We need to help connect others to the invisible God who loves them. Couldn’t this be difficult at times? An openness to spirituality in a general form might create difficulties as much as anything else. I’ll explain: there are many faiths and religions with many different gods– for an example, Hinduism. There are people in India who follow the teachings of Hinduism (or to bring it closer to home, amongst the 1.1 million Hindus residing in America today) who quite admittedly believe in Jesus…but they don’t subscribe to Christianity as their sole faith and religion. They simply add Jesus to the list of gods they already believe in. Mightn’t people in our spheres of influence who have “openness to spirituality” similarly assimilate Christ and the Holy Spirit and any acts of paranormal activity attributed to them into an already eclectic mix of beliefs about the paranormal, without understanding that any and all paranormal phenomena must always be subordinate to their faith in Christ, and therefore classified as “good” or “bad” solely in their relation to Him? In such an instance, all that we would have created is another half-hearted, luke-warm Christian who does not fully understand or follow what they claim as their religion. Of course, it is not truly we who create anything, or who can affect real life-change. It is Christ who works through us, and we cannot be too careful not to judge another’s heart or the condition of their soul. But the difficulty, I think, remains the same. Harm non and do as ye will….. what you put out you will get back…..The Spiritual Laws….being responsible for ourselves… that all thought, action, and energy we put out comes back…… if thought creates form…what do you think?….to forgive others for not being as perfect as you are… that we live, what we are taught…if we do not know, then how do we know, that we don’t know?…Organized Religion built an Empire controling people through fear….that they were going to Hell no matter what they did……self loathing…quilt.. denial of self love by sexual pleasures…. creating the dis-ease within….. Searching all our lives for a substance outside ourselves to fill that hole within…Our Genius is our souls potential. Living the teachings of the Christ and all Great Spiritual Teachers who teach the power of love and light…… Now It is time for the Spiritual wrongs to be righted….Ancient Prophecy becoming reality in today’s society. Unless…. Predictions of premonitions are dependent upon the information at the time of the Interpretation. See the Light, ask for truth….Wish everyone well. Put out what you want back…. Smile, they are contageous. glolady, you have some interesting ideas. How do you think that the world can be save? In your opinion, is Jesus’s life distinguishable from or different than other great spiritual teachers/leaders? What do you think? Mel, great points. One night after I spoke at the Mayan at Mosaic, I had conversations with 2 Hindus, a Muslim, a Buddhist, 3 Catholics who had hardly ever attended church in their lives, and several Christians who did not know God. All of them heard the Gospel and received Bibles. The Hindus readily accepted Christ while the others have continued their journeys in varying degrees. 1. We invite people to follow Christ and serve Him as the Leader of their life. This is very different than inviting someone to believe about Christ in order to go to Heaven. When someone truly commits to follow and obey Christ, the Spirit of God does a lot of the renewing of the mind. 2. We invite a person to be baptized by immersion. This creates another conversation about the commitment a person is making to Christ as their Savior and Lord. For example, so far, the two Hindu guys have not been baptized. This helped us realize they weren’t quite ready to embrace Jesus as God. The more we interact with others from different faiths the more we will gain insight into Paul’s methods throughout the book of Acts in reaching different crowds (compare Paul in a synagogue with Paul in Athens). The key is to develop relationships with those around us no matter who they are and be willing to listen to their lives and serve them whether they ever follow Christ or not. In that context, we will be amazed how our new friends will want to know more about the Jesus they see in our lives. what a wonderful time for authentic Christianity. i have an atheist friend who doesn’t believe in God and yet attends the church that I am a part of because of the love and the “mysterious presence” that he feels. He’s a spiritual atheist! He’s even begun to pray, just in case there is something out there. I was brought up to believe in the Holy Bible. That Jesus is the son of God, as we are brothers and sisters in Christ. That my God was great and my God was good. A good little Christian girl who had judgements of those I was taught to judge as less than. Since then, I have learnt every judgement of others that I had. I walked in the shoes of those I had judged. Now, but by the grace of God there goes I. Because of my experiences, I can see others with compassion, we do not know what we do not know. Until we are taught. The lessons that Christ taught were pure at heart. To Love others as yourself is the basic guide. There have been many Spiritual teachers who preach the same message, Brothers and Sisters in Christ. In understanding that the Interpretation of Ancient Spiritual texts have been redone many times. Chapters have been destroyed. Rewritten to best control people and that is thru FEAR. In understanding Predictions of Premonitions, we have a chance to change the direction of future events. It has been written what will happen if we do not become enlightened and that is Hell and Damnation. The easiest way to control people. Then we have the guilt, remorse, self loathing, anger, the self imposed Hell on earth that battles in our minds. As I forsee future events, there is a chance to save the World from doom and gloom. That is through Love and Light. It has been predicted that 20% of the World will be covered in fire. Remembering that Prediction is based upon the knowledge at the time of interpretation. If we were to glow the World with Glow in the Dark Safety products, that would look like it was on fire. Using the revenue for self supporting farms to heal the soul. To heal the dis-ease within. Building upon the business plan of Milton S. Hershey, founder of Hershey foods. “Where Business is a matter of Human Service” This is a link for my plan to Revolutionize the US economy, Healing Society in the process. first time on your new blog … great stuff … what do you make of the idea that spirituality and materialism are synthesizing into a completely new worldview? Words such as “creativity” and “diversity” (along with all the other words you and your cohorts are contributing) are the hieroglyphics (elementary words of the worldview). Just a thought I had … anyway, thanks for blazing the trail into the future! your contribution is unparalleled! Thank you for providing more thoughts. I am trying to understand what you’ve written and have some questions: Do you see yourself as the leader in this movement? Where in your life, now, is the Jesus of the Bible? Jesus of the Bible is a Great Role Model for living a Happy, Joyous, and Free Life. The true meaning of Love and Light. Loving all people unconditionally. The Ancient texts claim 12-21-2012 is the end of the World as we know it now. Then what? It has been stated 1,000 years of peace. Until then we have a chance to change the outcome. My Astrology chart reads that I am like Moses on the Mount. Paranormal is my normal. Mystic by birthright. I can make you wonder, warn, scare, or just freak you out. If I did not have physical proof, you’d call me crazy. The man who says that you can’t save the world, is the one not willing to try. I think Jesus is the worst example of how to live a happy life. Phrases such as, “Take up your cross” and, “Deny yourself” don’t seem to inspire happiness. Oh and let’s not forget Jesus saying he was going to bring enmity between those who choose to follow him and their families. Jesus’ goal was not to be a role model, it was to be master, boss, and El Capitan of our lives. If Jesus hadn’t risen from the dead, he would be rolling in his tomb thinking about all the people who view him as a role model with no greater influence than a shirtless Brad Pitt poster at a 13-year old girl’s sleepover party. I couldn’t care less if someone can levitate, manifest gold rings out of thin air, predict the future, speak in unknown languages, heal sickness, blah, blah, blah. Without radical love for the Creator and for the created, all of the paranormal activity is of no more value or interest to me than magic tricks at the County Fair. After the shock and awe of a fortune cookie telling me I will soon find love only to then run into a hot girl at the grocery store wears off, the only paranormal (beyond normal) experiences I am interested in are whether or not humanity will move towards a “beyond ordinary” love for one another tomorrow. I am curious of how you came upon this website? You said you grew up believing in the bible and in Jesus Christ. Do you believe in Jesus as the only Savior of a dying world? That man can not save man? What are the Ancient Texts you keep referring to? As far as the comment above from Cliff…you say “Who Cares about the paranormal?”…seems like 33 comments so far, and a new visitor to this site saying that she is in fact involved in the paranormal is your answer. Just because you do not believe in what GloLady believes in does not make you better, or more fit in the eyes of God. It is not our job to belittle peoples beliefs, but to steer them to the True Light of Christ. Bro, or Miss, you seemed to have missed the point. My, “Who cares” question was rhetorical, #1. And I followed my question through with my point, which seems to have been overlooked. And since when does completely disagreeing with someone equal me belittling people or elevating myself as superior? And you say our job is to steer people to the Light? So are you using the word steer like one would steer a car… in the same manner one forces a car to change direction, we are to force people to the light? I’m sure that’s not what you meant; I’m just trying to show you how annoying it is when someone removes a single statement from context. In love, bro or miss. The phrase “paranormal” doesn’t quite do it for me. The Meriam Webster online defines paranormal as, “not scientifically explainable.” And I agree with that. But, for me, there is a lot that is not scientifically explainable. I want to express that the spiritual world is more than that. For me, the word “supernatural” is more to the point. MW’s definition: “of or relating to an order of existence beyond the visible observable universe; especially : of or relating to God or a god, demigod, spirit, or devil.” I know it seems like a matter of semantics, but since this whole discussion is based on words and reading… For me, this helps me to distinguish between alien activity (as some deem paranormal), and spiritual activity (supernatural). Does that make sense? I hope this steers (guides, not forces…) the discussion into a spiritual realm. Freedom of choice in your belief as to the outcome. You are responsible for you. What energy are you putting out? Positive or negative. Trusting in a Power Greater than you to guide your life. That all things work out for good. Looking back at all the “bad” things that ever happened in your life and then see the good, which has come out of the life changing event, if nothing more than strength. What was the lesson? Where was the growth? Challenge yourself to your greatest potential, your Genius. This is information that I wrote in September, before Rita came. Explaining my ability to predict catastrophic events. Blessing or curse, I do not question the talents that were given to me. Premonitions that I received are felt as energy through my body, similar to a shiver. The dreams come at night. Flashes of impressions fly through my mind coming in forms of symbols and numbers that I interpret. The problem with predictions is the exactness of the date. Some what like the bible code, these numbers and symbols link together. On July 4, 2005, Tropical Storm Dennis was formed and named at 11pm. Those in London, I am sure will find the other connections better than I.
July 7, 2005, the 1st of many emails were sent to Major news media, CNN, CNBC, FOX, President Bush, LA Government, Oil Companies, among others. Warning of this Catastrophic event. The 1st email warning of this event was sent out after Dennis bounced off the Keys in Florida. Knowing that this impending disaster that would occur. When Dennis did not hit New Orleans, I then sent another warning, stating Not to think that my premonition was incorrect. Watching the news on August 25th, I knew this was the premonition that I had received. When mandatory evacuations were not made on Saturday, Again, emails were sent warning that if they waited to issue a mandatory evacuation that it would be too late the next day. In understanding that my premonitions need interpretation. Do I need to explain the results? A Catastrophic event that could have been avoided by issuing a mandatory evacuation earlier than the day before. Mandating the Airlines to fly passengers out until the weather warranted otherwise. Evacuation plans prepared Before the event. No One has yet answered the questions that were asked before. Where are the rail cars that became bowling balls? Why were the predictions from the psychics ignored? What comes in 2’s comes in 3’s, the third to bounce off the Keys will spread the disease. It is Not going to be pretty in the United States. Continued devastation occurring from Category 4 hurricanes. The Bigger they are the harder they will fall. The Insurance Industry, the Oil Barons who line their pocket with greed, Corrupt Government officials revealed. wow, I love this conversation that’s going on. It has multiplied into several distinct threads: hope all of you are willing to add to whichever one you like, without feeling you must respond to the comment immediately preceding yours (or any of the other threads that interest you less at the moment). I agree with The Bishop, semantics will either be the huge stumbling block to understanding in this conversation, or it will be the stepping stone into more relevant engagement of contemporary culture. It’s helpful to remember that most of the general (and loaded) terms used so far in all the threads represented here are like medical terminology used in early stages of understanding some new disease or disorder (even those are loaded terms). For instance, AIDS and ADD and Chronic Fatigue Syndrome were originally just descriptions for a collection of symptoms that mysteriously went together. I have ADD, my mom has Sjogren’s Syndrome. Research has since discovered that the symptoms of AIDS are caused by a bizarre virus (HIV); ADD turned out to be caused by a dozen different things, from simple lack of sleep/nutrition/exercise, to sexual molestation, to biochemical imbalance in the brain, to aurovestibular “disorder” (that’s me: medics have isolated where and what is causing my symptoms, but don’t yet know how, so can’t fix it). Sjogren’s is still a mystery. So is CFS. But we must be careful about using old terms to describe the state of the spiritual realm. Doctors no longer talk about finding “a” cure for ADD; they even will ask whether you mean ADD or ADHD or some other subset of the symptom-collection, to be sure they know what you mean. A dozen cures and treatments are needed for what used to be called ADD, depending on the cause they address. At least one cure and several effective treatments are already well known (counseling/intervention, albuterol, ritalin, a good diet/exercise/rest program). In the same way, “paranormal” and “supernatural” (and “mystic” and “spiritual” etc. etc.) can be dated terms, or they can take on a fresh relevance and power, depending on how we use them. Hearing Erwin McManus, Roberta Mathewes-Green and Brian McLaren debate one another throws this issue into high relief. Most important, after acknowledging that the “three in four Americans [who] hold some paranormal belief” perceive reality better than modernists trapped in Enlightenment’s paradigm, is to recognize that most terms to describe spiritual reality need to be heard with grace, appropriated and re-interpreted with biblical wisdom. When an acquaintance tells me of her clairvoyant experiences, I don’t react in horror and rebuke her for trafficking with satan. She may be using the only words she knows to describe God’s miraculous activity in her life. Or perhaps the occult really is involved… I learn more in conversation about how and why that’s true, than I do in earnest argument about how wrong she is. (Although the time may come when I must do that too) And when I try to explain my own Mystic encounters in language familiar to her, will my christian friends encourage or rebuke me? Tommy Watson said Now that we are aware of this pattern we should all the more exhibit the â€œparanormalâ€ that lives within us. That’s not just a profound thought. It’s a trumpet call to action– and careful semantic creativity. I just posted on my weekend in LA. Thanks again for your awesome hospitality and a great day. Look forward to the day when your search for the mystic brings you to Winnipeg… and it will. Judging by the silence, many are deep in thought. As you can see all the Natural Disasters happening around you that you can’t deny. Why is a question to be pondered. Something else to consider… The Mark of the Beast… even if you were not brought up in a religous manner. The numbers 666 have been known as being evil. Next year is 2006. Would you like to hear my prediction for 060606? What will it take to save the World? The Passion of the Christ is being willing to do and say what you can to save the World. Seriously, the passion of the Christ was to do the will of His father. I agree with the sentiment, but there is a deeper undercurrent to this than just saving the world; making our Glorious King famous. I know that the two go hand in hand, but the reason I bring this up is to remind us that it is His work to save people. It is His work to build the church. And, it is His perogative to use us to His glory. That brings me back to the supernatural. When God uses us, the supernatural becomes “visible” for people to see. When the Christ is present in the lives of His people, the supernatural becomes the modus operandi for life, and not a random or out of the blue occurence. As to predictions for 06/06/06, I predict that Christ will change more hearts, more will enter the mystic, and more will enter eternity unprepared. And, I predict that I will do my very best to make sure that I am available for God to do the supernatural through, but blow it every now and then. Good points bishop…it is always…and is always brought back to Jesus. Dang, brotha, bringing the house down! Or should I say building it up? Those were some great points (though disagreeing on the glory prerogative). This was going back to a point I made that the Apostle Paul originated. Essentially, “No one gives a crap about dreams, visions, tongues, healing, or wisdom… if you don’t love then it is just noise”. I don’t give a crap about signs or visions or revelations or the end times. I care about intimacy and intimacy alone. Being intimate with God and being intimate with people. When God returns to earth, I want Him to find me washing feet rather than sitting in my study looking for the signs of the times. Your passion and zeal are very good! Holding to something that is greater than yourself is a very positive thing. I would start asking yourself, “Why visions?” If you are having them, they must be for a reason. I’m sure whatever form of deity you believe in must be intentional. So start praying and asking God to reveal to you why you are being given these visions. God should have no problem agreeing to that request considering He is revealing everything else to you. Who knows? Maybe God is trying to show you something far more profound and of greater importance than visions of the future? Keep me posted on your conversations with God. I would love to hear what He tells you. Knowing Mercury is retrograde and communtcation can get screwy…… was my last post not on the internet to be seen by all or just a paste on my screen? Was I censored off another public media source for the truth I share willing. Where is the profit in Peace. The amount of revenue in war to be made far exceedes that which is in Peace. That saying “Jesus is coming and Boy is she pissed” Does Mother Nature ring a Bell? Okay, I must say something…â€œJesus is coming and Boy is she pissedâ€ Jesus was in human form a man. God, The Father, portrays Himself as a man. Jesus, the son born to Mary, related to God as Father…The Bible is quite clear on this point. And, while I understand that God is both spirit and truth, and in some way that transcends gender, He chose to relate to us as a Father, a man, a groom, and some other male images. And, I’m not sure what the intention was, but it looks like you equate Jesus with Mother Nature…bad idea. While God chooses to move and intervene through His creation, he is separate from it. He is not bound by nature, time, or any other constraints aside from Himself. Third, this isn’t exactly a public information swap. So, I’m sure that the “powers that be” have the privelege/responsibility to ensure that the information that is shared here is to the great glory of our Great God. It is not about peace or war. Profit comes when we are obedient. Obedience over activity should be the theme of our lives. And, in his teachings, Jesus commissions us to love, to be known by our love, and to live at peace with all men as far as it is up to us. So, obedience leads us to peace, and obdeience is the source of profit. You can’t walk on water if you won’t get out the boat. I did not mean to spread any fear when I rocked your boat. My boat’s not rocked, and there’s no fear here. I just wanted to know if your boat is way of course. has my Spirit photography. Even with physical proof… people doubt. Since time has passed…we see the Earth changes more apparent. It is said that the dead in Christ shall rise 1st. Judging by the paranormal activity that I have been capturing in my photos… Revelations has begun….